“BUCHER: MY STORY” By Commander Lloyd M. Bucher, USN, with Mark Rascovich. Before taking command of the USS Pueblo (AKL-44) Commander Bucher served in the submarine service. Here at last, the man who stood at the center of the most incredible events in the history of the U.S. Navy, tells the story of the capture of the USS Pueblo and her crew by the North Koreans in 1968. Despite the fact his vessel was operating in international waters, the Pueblo came under attack by North Korean naval forces. The North Koreans boarded the ship and took her to the port at Wonsan. For the next 11 months, Commander Bucher and his crew were held as POWs by the North Koreans, and were starved and tortured during this time. Bucher, was tortured and put through a mock firing squad in an effort to make him confess. Eventually the Koreans threatened to execute his men in front of him, and Bucher relented. In December 1968 the North Korean government decided to release the 82 remaining crew members. Told with rare honesty and candor, the book is a revealing portrait of a man whose quiet courage sustained him and his crew through an ordeal few naval officers before him have had to face. 1970 Hardback with dust jacket. 447 pages, 53 black and white photos, 4 diagrams. Appendix and glossary, no index. Complete USS Pueblo crew roster. Large maps inside front and back covers. Dust jacket shows much wear (see book photo above), but still mostly intact. Lloyd Mark “Pete” Bucher was born in Pocatello, Idaho on September 1, 1927, where he was given up for adoption by his birth mother, and was orphaned at an early age. His adoptive mother died of cancer when he was just 3 years old. Young Bucher was raised by his father, grandparents and various other family members. During World War II, Lloyd dropped out his senior year of school to enlist in the U.S. Navy, serving the last year of the war and for two years afterward (1945–1947). As an enlisted man, Bucher reached the rank of quartermaster second class and obtained a high school diploma. He then worked in construction and as a bartender before entering the University of Nebraska on a football scholarship in 1949. While attending university, he signed up for Naval ROTC. He graduated with a BS degree in 1953 and was commissioned an Ensign in the U.S. Naval Reserve. In January 1954, Bucher was called to active duty and served as division and education officer on the USS Mount McKinley (LCC-7). It was in mid-1955 that Bucher was admitted to submarine school at New London, CT. After graduation, Bucher served as torpedo and gunnery officer of the submarine USS Besugo (SS-321), operations officer of the USS Caiman (SS-323), and assistant plans officer for logistics on the staff of Commander, Mine Force, Pacific Fleet. From 1961 to 1964 he served on the submarine USS Ronquil (SS-396) rising from third officer to executive officer, after which he became an assistant operations officer on the staff of Commander Submarine Flotilla Seven in Yokosuka, Japan. Commander Bucher loved submarines and his greatest desire was to command one. However, he was a conventional submariner not trained in nuclear power, and his career options became limited when the submarine force became increasingly populated by nuclear-powered submarines. As a result, when Bucher screened for command, he was slated for command of an auxiliary surface vessel outfitted for communications and signals intelligence (COMINT/SIGINT) collection, in this case, USS Pueblo (AKL-44). In January 1968, while monitoring North Korea, the Pueblo came under attack by North Korean naval forces. North Koreans boarded the ship and took her to the port at Wonsan. For the next 11 months, Bucher and his crew were held as POWs by the North Koreans. On December 23, 1968 the crew was taken by buses to the demilitarized zone (DMZ). Exactly 11 months after being taken prisoner, Commander Bucher led the long line of crewmen to freedom. 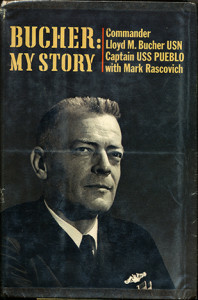 No American military operations have been attempted to retrieve the USS Pueblo. The ship remains in North Korea as a tourist attraction. Lloyd Bucher died on January 28, 2004. He was buried at Fort Rosecrans National Cemetery in San Diego, California.